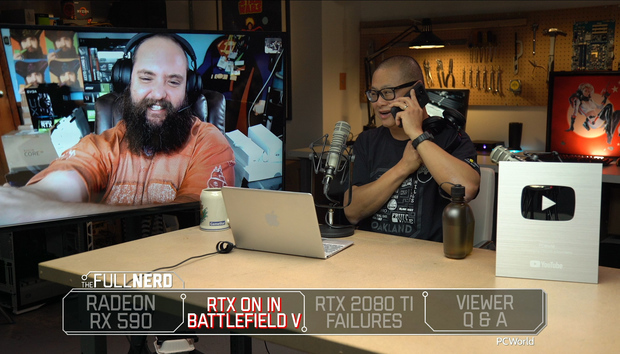 In this episode of the Full Nerd, Gordon Mah Ung, Brad Chacos, Adam Patrick Murray, and a very special guest delve deep into graphics card news. First up: A recap of our XFX Radeon RX 590 Fatboy review. AMD’s first 12nm GPU is a GTX 1060 killer, but how does it compare against the existing Radeon RX 580? It depends on the sales you can find. We dive into the RX 590’s tech specs, value proposition, and more. After that, we turn our attention towards Nvidia, which had a momentous week of its own. Battlefield V officially turned RTX on, making it the first-ever DXR ray traced game, and thus the first game able to leverage the dedicated RT core hardware inside of Nvidia’s GeForce RTX GPUs. The very next day, though, Nvidia confirmed reports of RTX 2080 Ti Founders Edition failures, blaming the issues on a batch of bad units that wasn’t caught in quality testing. Finally, as usual, we field questions from the live viewers. If you tune in live you can pick our brains! You can witness it all in the video embedded above. You can also watch The Full Nerd episode 74 on YouTube (subscribe to the channel while you’re there!) or listen to it on Soundcloud if you prefer the audio alone.